Why my Rainbow smell bad? Does your rainbow stink when you use it? Are you wondering…why my rainbow small bad? After all, it supposes to clean and make my home healthier. Well, the Rainbow also need a minimum care after each use. If you clean and then left the Rainbow with dirty water for a long time, chances are that your machine got a bad smell next time you use it. That happens because the smell of stagnated dirty water for a long time goes inside the rainbow and impregnates in the HEPA filter. In order to remove this bad smell, you’ll need to remove, clean and reinstall your HEPA filter. It is also highly recommended to pour a cap of the Rainbow concentrate Fresh Air solution into the Rainbow water basin. Fill with water as always and let the Rainbow running for 10 minutes. Rexair recommend checking your HEPA filter for dirtiness every two years. HEPA filter gets dirty if you use your Rainbow without water, low level of water or if you use it for a longer period with the same water. Do not allow the water to get too moody or solid. The water needs to be in liquid form in order to trap the dust. check this quick video for more information about cleaning the Rainbow HEPA filter. NOTE: HEPA filter can be cleaned only one time in order to maintain its efficiency. Check the exhaust part of the HEPA for holes or broken parts of the core of the filter. If you already cleaned your Hepa more than one times or you found holes in your filter and want to get a new one, please let us know. Throw away the dirty water and clean the Rainbow basin immediately after each use. 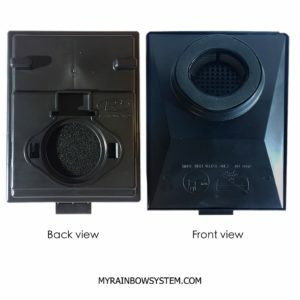 Store your Rainbow in a clean and dry place without the water basin in place. Store the water basin separate from the Rainbow after clean it. If you want to leave it running at minimum speed to aromatize and clean the air in your home, use it with clean water. Clean the Rainbow separator at least once per year. Do you already clean the HEPA filter and want a fresh air? If you have any additional comment, please use the form below to share your thoughts so everybody can take advance of it, or you can personally contact us. My rainbow vacuum cleaner is about 21 years old. When I went to use it yesterday it started to smell very bad. I tried to clean it but I cannot remove The spinning dial at the bottom. What do I do? The Separator is supposed to be removed and cleaned at least once per year. When it is not clean for a long time eventually get stock and very hard to removed. When this happens the only way is to take your Rainbow to an authorized distributor/repair place. Sorry for that, but I hope next time you wouldn’t let this happening again.